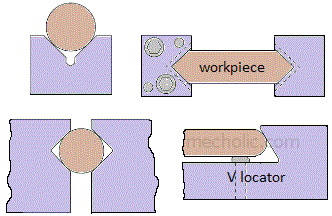 The locating device and method depend on the shape of components. The different types of locating devices described below. One of the simplest form of locator. In which a round pin/ button/ plugs is used to hold the component in position. The main difference between pin and locator is of its length. Buttons are shorter in length when compared to pin. The large size referred to as plugs. Pins are generally used in a horizontal location, while the button is used for vertical location. Pin and button type of locator also made to adjustable type(adjust the length according to requirement). The locating buttons are either press fit type or screwed type. 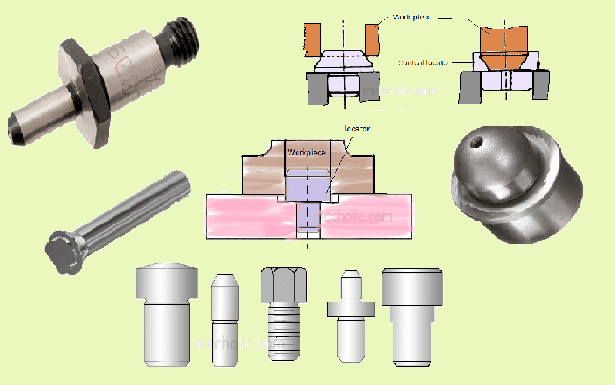 Lock screw pin type enables quick replacement, and it is used where more tear and wear of button occurred. The cylindrical locator are best for accuracy in location because threaded locator cannot align the components accurately. 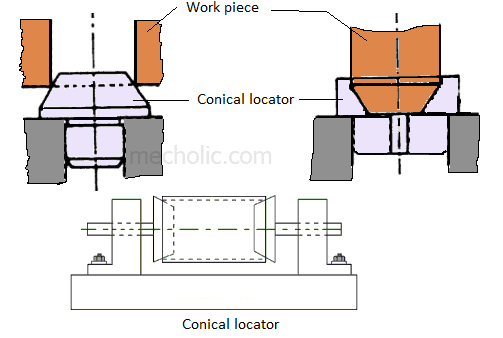 Fig(a) shows a pin used to locate workpiece fig(b) shows button type used for locating component. Pin and button locator can again divide to fixed type and adjustable type. the fixed type pin and button has a fixed length while in adjustable type, the length of pin/ and button is adjustable according to needs. The adjustable model is used where the surface of component is rough and uneven. 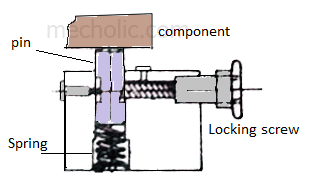 Following fig shows spring loaded jack pin which keeps the supporting pin locked. These are the simplest form of locating method. it is suitable where finely finished holes are available for locating purpose. fig(a) and (b) Shows the cylindrical locator used for small holes. First one shows plain locating pin whereas the second one shows the locating pin with flanges. For large holes, the pins shown in fi (c) is used. Rest pad and plates are similar to button locator; it is usually used to support and locate workpiece vertically. They do not have a shank; Instead, they are held to jig or fixture base plate by using screws. 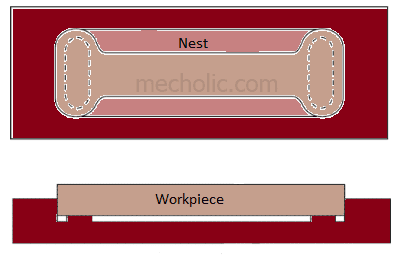 Rest pads are generally used to support larger and heavier surface as well as the previously machined surface. Above fig shows the nesting type profile locator. In which the component enclosed in a depression of the same shape. Since it must confirm the shape, it is expensive for complicated shape. However, it is the most accurate profile locating method. V locator mainly used for round workpiece. Centralizing feature is the main advantage of V locator.